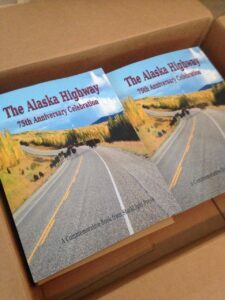 Thanks to all those who recently ordered a copy of The Alaska Highway: 75th Anniversary Edition, making this our fourth run of the book! Books will be delivered to StarkLight Press warehouse by July 15th, and will be available for pickup after 4 pm that day. For our customers in North America, your books will arrive by post by July 27th. For international customers, orders will be arriving by August 15th. Thanks again to everyone who has helped make the 75th Anniversary of the Alaska Highway into such a huge success!